I'm not even done with my Korea photos and now I have some Sydney stuff to go through. I didn't shoot that much in Australia. My only goal on the trip was to capture the famous Sydney Harbour Bridge and Opera House. I know. Completely original. This is just a quickie for now. I'll be perfectly honest. I knew this would make a great Facebook cover photo. So I quickly edited it and cropped once for this blog and again for the Facebook cover photo dimensions. For those interested, I shot this shortly after the sun had set. I used a 10-stop neutral density filter to achieve the cloud motion effect—for some reason, I'm slightly obsessed with that lately. The actual settings are ISO 50, f/8.0, 120 seconds. 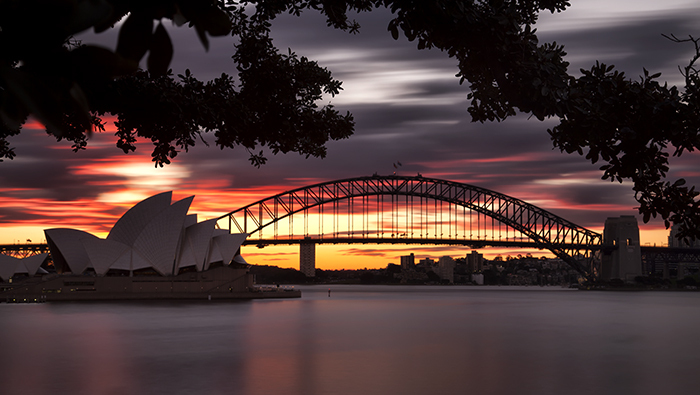 I took this from Mrs Macquarie's Point, where I found a tree that served as a nice frame for my subject.